In many ways, RVs are enigmatic beasts. This is mostly due to the way we use them. You don't get to drive these hulking behemoths on a daily basis. That robs us of the familiarity we have with our daily-use cars and SUVs. If anything happens with their tires, we can quickly feel it. RVs and trailers, on the other hand, spend a lot of time in storage. So you need to put in extra effort to maintain and safely use of RV tires. Now my answer to the main question. Vehicle gross weight is an important factor that many RV owners ignore. All RV tires have a PSI value stamped on their sides. RV'ers often take a glance at this number and inflate their tires to this value. The assumption is that this PSI value is the recommended pressure level for the tire. This is wrong! That number is the GVWR rating of the tire: which means that it is the maximum pressure for the tire when the RV is at its maximum load capacity. Unlike cars, individual RV weights can vary greatly, depending on how much stuff you put inside. Unless you are loading your rig to its maximum capacity, filling the tires to the GVWR value means that you are overinflating your tires. This results in poor control and braking, due to decreased tread contact with the tarmac. Always make it a point to weigh your RV before inflating the tires. This is especially important if you are taking the RV out for a spin after extended time in the garage. You can use Cat Scales at truck stops to easily figure out the current weight of your rig. Use portable scales if you think that the RV is heavier on one side. CAT scaled do not give you an accurate measurement of weight on individual wheels in an axle. Setting the right tire pressure according to axle weight is just part of the equations. Once you do that, you have to perform constant pressure checks on those tires. Use a gauge or tire pressure monitoring system for this. And remember, you have to do it before every road trip, not just once in a while. And do not use any casual methods. Get the gauge or pressure monitor. You cannot get accurate measurements without these devices. Casual glances or use of a baseball bat will not reveal everything you need to know. A difference of just 10 PSI can result in reduced carrying capacity, and increase the chance for blowouts. 10 PSI is too low to be detected using casual methods. Cars and trucks are exposed to centrifugal forces on a daily basis. Thanks to this, their tires have soft and supple sidewalls. The softening components from the rubber inside the tires are continuously driven to the sidewall by the pressure. RVs on the other hand, sit idly in storage for weeks, or even months and years. The sidewalls of the RV tires do not get the softening compounds, which means that the exposure to weather changes affect the tire quality. The result is dried and cracked sidewalls. Do frequent inspections and take the following measures to reduce the chance of weather damage. Protect your RV tires with covers if you plan to keep them parked for more than one week. Also, avoid using aftermarket sprays with alcohol in them on your tires. Alcohol will exacerbate the drying effect. Tire treads have to withstand a lot of punishment, and this is doubled if they are RV tires. The combination of heavy loads and uneven road surfaces can result in damaged patterns, low treads, and even whole missing chunks. Treadwear can also be a symptom of improper weight distribution or misalignment in your RV. Thinner threads on the inside or outside are a sure sign of these imbalances. Another common symptom is contrasting surface quality on the tread: if it is smooth one way and exceedingly rough (or "feathered") on the other end. Ensure that you are using at least 4/32" tread on RVs above 10,000lbs, and 2/32" on vehicles under 10,000 lbs. And inspect your tires frequently, with a proper depth gauge if possible. 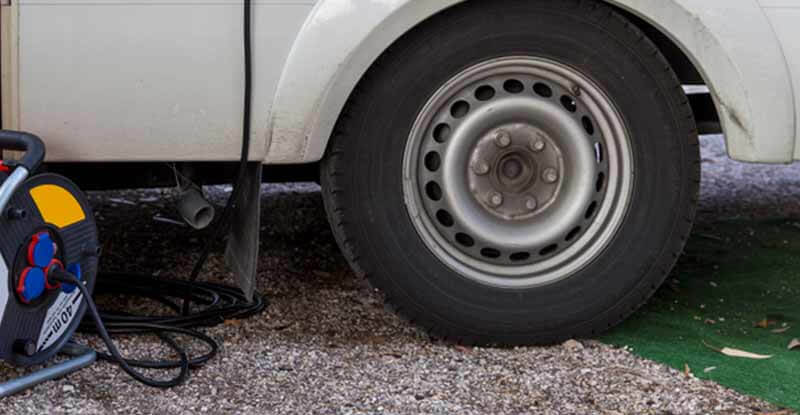 In the off-season, use the following measures to keep your RV tires in pristine conditions. Oils tend to accumulate on the treads after each road trip. Use soap and water to clean these off the treads. Reduce the load on the tires by removing all the excess baggage from the RV. Try to keep it as close to the minimum weight as possible. Keep the tire pressure at recommended levels immediately before storage. To take off that weight from your tires, you can use some storage blocks. This will take a lot of pressure from them. Do not expose the tires to direct sunlight for a long time. To prevent cracking of the tire sidewalls, consider taking your RV out for a spin every couple of weeks. Try not to hit the max weight limit, and if possible, keep it well below that limit. And when you load the RV, try to maintain an even load distribution between both sides of the vehicle. Avoid overloading individual tires at all costs. How long do RV tires last anyway? A rough ballpark figure would be five years max. At any rate, tires should not be allowed to stay on for more than six years. It doesn't matter if they appear to be in decent condition. Six years of bearing the load of an RV, even with minimal road use, can result in severe degradation of the tires. Have you ever noticed how rubber products age and degrade over time, especially when left out in the sun? RV tires are no exception. Car tires tend to get replaced due to wear and tear from constant use. Most RV tires, on the other hand, end up in retirement due to old age. Use the DOT identification number on the tire to find out the true age of a tire, even if it appears on a brand new RV. That vehicle might have been in storage in the showroom for a good while, so you have to take that time into account as well. The last four digits of the DOT number refer to the week and year of manufacture. For example, number 1715 implies that the tire was manufactured in week 17 of the year 2015.